We’re thrilled to be able to offer you a chance to see the Heartless Bastards when they’re in town next Monday for free. For a chance to win a pair of tickets to their 4/9 show, just send an email to SEAliveMUSIC [at] gmail.com with the subject line “Got to Have Rock and Roll” by noon this Friday. Aren’t familiar with Heartless Bastards? They’re a down-home American rock band from Austin (via Ohio). Lead singer Erika Wennerstrom has a strong, soulful voice that commands the attention of the room. 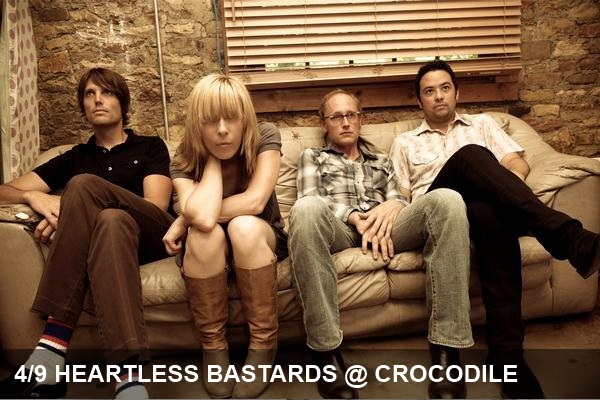 Erika’s vocals, paired with the raw energy of the backing band, Heartless Bastards offers the type of hard-driving, earthy rock you can’t help but feel in your bones.